I like to make myself a good brunch on Fridays. You see, I don't work on Fridays. I'm all relaxed... I potter around the kitchen, and I really get in touch with my ingredients. I'll take the time to breathe in the scent of thyme. I'll lick a bit of balsamic reduction off my fingers. There are certainly plenty of things for which I can be thankful on Fridays. 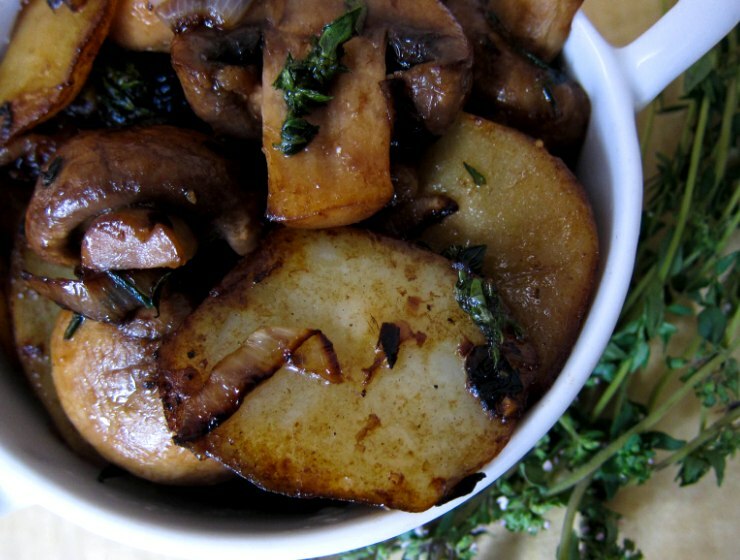 balsamic thyme mushroom & potato fry-up. This pan-fried mushroom and potato dish with shallot, thyme and balsamic vinegar... it's one of those things. It's vegan, but the mushrooms provide a meaty component to the dish, and it's gluten-free, but the potato satisfies those carb cravings. The shallots are deliciously charred, the thyme fragrant, the balsamic vinegar sweetly acidic. Hearty, yet not too heavy. Robust, yet still quite gentle. My kind of brunch. Heat up a couple tablespoons olive oil over medium heat and fry the garlic, shallot and potatoes. When the potatoes start to char a little around the edges, put in mushrooms, balsamic vinegar and thyme leaves. Slosh in an extra tablespoon of olive oil, too, and even a little bit of water, if the pan looks too dry. Stir-fry until mushrooms soften, then season to taste with salt and pepper. If desired, add an extra dash of balsamic vinegar and a sprinkling of fresh thyme. Try this with toast... perhaps with a gently cooked egg encasing a perfectly runny yolk. And it doesn't just have to be for brunch or breakfast, of course. It would also make a great side with your other main meals! 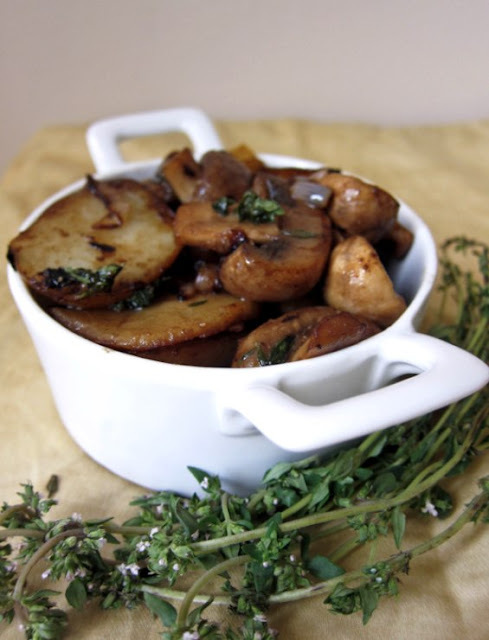 pan-fried mushrooms and potatoes with shallot, thyme and balsamic vinegar. Every one of those ingredients speaks to me. I feel like I can smell the delicious fragrance that filled your kitchen. Oooh, you don't work on Fridays. Nice! Well, potatoes for brunch are just about the best thing in the world, and this looks delicious!!! I'll have to try this recipe! It sounds delicious on a cold winter day. I thought you might like this, Sarah. Thyme has such a beautiful fragrance, doesn't it? Thanks Trix! Indeed, Fridays are my Saturdays. My mouth is watering over that recipe! Maybe brunch this weekend. That's amazing! And the perfect side-dish to the steak I am having for dinner tonight. I'm on break now, but I didn't have uni on Fridays in my last semester so Fridays were also my 'make something nice' days :D The flavours in this sound so good! Thanks Foodycat! Yes I think that will go nicely too, especially with the cold weather where you are right now. It's got the comfort factor. Thanks Von. I do so love 'make something nice' days. Such a satisfying way to reset myself. 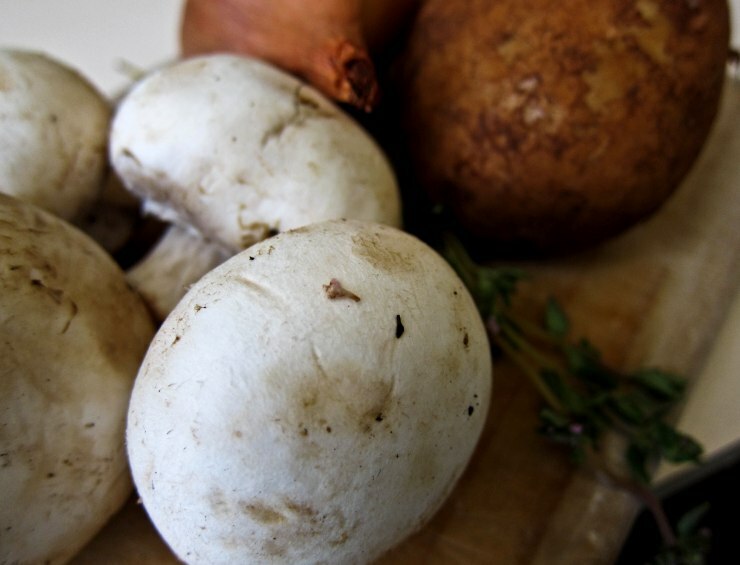 I've never thought of using mushrooms to give that meaty component to a dish. Hmmmm interesting. Looks good and hearty indeed! Gorgeous flavours and photos. I love the combination of mushrooms and thyme so this dish looks perfect! Thanks Winston! Yay for another idea you can add to your repertoire! Perfect work / life balance! Ooooh, leaf, you shouldn't be showing all the things you do with a mushroom. This is bound to make a Frenchwoman like me swoon. This dish is just so YUMMY! And yay for Fridays. If you cook like that, I'm all for it! that sounds like me on a sunday (: the mushrooms sound delicious. i love love love mushrooms. aaaahh, I'd love not to work Fridays. But you di bring up some good points- I'm such in a rush these days I forget to really take the time to appreciate the ingredients. Thanks! This sounds delicious. A little char on the potatoes and the vinegar must really create great flavor. I'm so happy to have discovered your blog and this post. My two favourite breakfast sides! I am eating buttered garlic mushrooms right now! Looks delicious and so easy as well. Will need to give this recipe a go soon! Great photos and recipe! I love mushrooms!